New data from Facebook suggests TV advertisers are receiving at most half the attention of viewers. What are they doing to distract themselves during the ads? The smartphone and social media are to blame. In many developed markets around the world, the number of people with a smartphone far outnumber those that do not. In the US, 77% of people say they have one, while 72% say the same in Germany and the UK. Developing markets also have significant penetration. 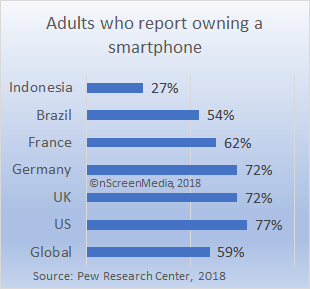 For example, 27% of Indonesians have a smartphone and 54% of Brazilians. According to new data from Facebook IQ most of us like to use our phones while watching televisions. 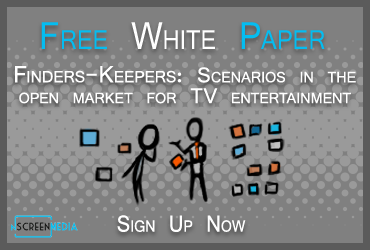 Moreover, the device poses special challenges for TV advertisers. Facebook commissioned a passive eye- and device-tracking study that examined the behavior of 763 self-reported Facebook users and TV viewers ages 18+ in six countries. The company found that attention to the television was much better during a TV show than during the ads. During the TV program, mobile received 28% of a viewer’s attention, but during the ads, mobile commanded more than half of the viewer’s attention. In Germany and the US, the people devote slightly more attention to the mobile than the TV. However, in the UK and France, the mobile commands more than half of the viewer’s attention during the ads. Indonesians give just a third of their viewing attention to the TV during the ads. Since people in the survey group were all Facebook users, it is understandable that social media was the focus of much of the mobile activity while watching television. On average, across the six countries examined, 43% of the time spent using the mobile while watching television went to social media. Messaging apps are the second most popular activity with 16%, using the browser was third with 14%, and gaming fourth with 8%. Indonesians devote the most time to social media, 62%, and France the least, 27%. However, social media was the most popular app in all six countries. Other data seem to suggest the Facebook survey results apply to the general television viewing population. Global Web Index reports that Facebook and its properties Facebook Messenger, Whatsapp, and Instagram dominate social media. Globally, 9-in-10 people have an account with one or more of these services. In other words, Facebook’s survey participants represent most of the population in each country covered. Further, the use of social media is a key focus of activity on smartphones. Worldwide, Kaspersky data shows social media is the second most popular activity on a smartphone, slightly behind email. Looking at the US market, Nielsen says that the average smartphone owner spent 252 minutes per day using their smartphone in Q2 2017. Of that, people spent 70% of their time in general app and web usage. Social media commanded 20% of their time. These are particularly challenging times for TV advertisers. People are watching more on-demand and skipping the ads. They are also giving less than half of their attention to the advertisements they do watch.